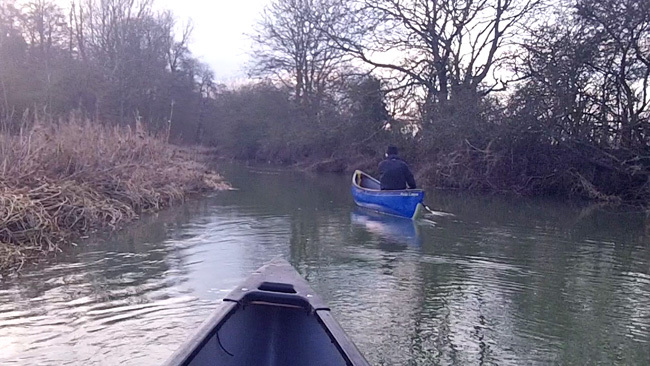 If you are looking for an adventurous paddle near London, the Swift Ditch is worth checking out. This was once the route of the Thames itself, until the crafty monks at Abingdon diverted the river to power their mills. Since then the channel has been reduced to a narrow, tree choked channel – picturesque in summer, challenging in winter. Other than a sloping weir at the start of the Ditch, there is little white water, but the flow can be fast. Low branches and blockages create obstacles which require careful navigation – you wouldn’t want to paddle in here without moving water skills. We tackled it in January 2013, shortly after heavy winter flooding and in rather cold conditions. Having parked in Abingdon at the Abbey Meadow Car Park we paddled along the mill stream, past Abingdon Weir and then upstream along the Thames. The Swift Ditch is the second small channel on river left (on your right hand side as you paddle upstream), both of which are marked with Danger signs. 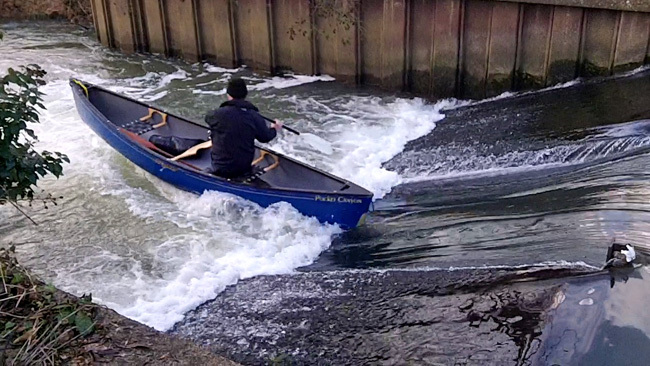 Inspect and then drop over the ramp weir – if you are in an open boat when you do this you may find a surprisingly large quantity of the river joining you in the canoe. With our open boats we had to portage four or five times. At other times we were able to squeeze over and under the braches that obstructed our passage. If there was any wildlife to be seen, it saw us first and buggered off, although we did surprise some curious lamas in a field near the end of the river. The Swift Ditch eventually emerges once again into the Thames, having passed under a couple of old stone bridges. 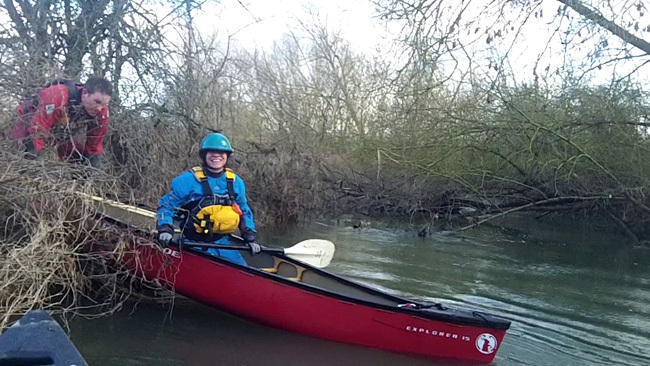 In summer levels the paddle back to Abingdon would usually be pretty easy, but we had the force of a swollen river to contend with and it was slow, hard work at times. Back at the car park, we washed the mud and crud from our boats and massaged life back into our chilled fingers and toes. We then walked to the The Nag’s Head on Abingdon Bridge for some quality grub (but not much for the vegetarians) and gorgeous local beers. If you’re looking for something different to do, this would be a great paddle in warmer conditions, for those with sufficient experience. It’s a beautiful part of the country and once on the Swift Ditch you could be in the middle of nowhere. 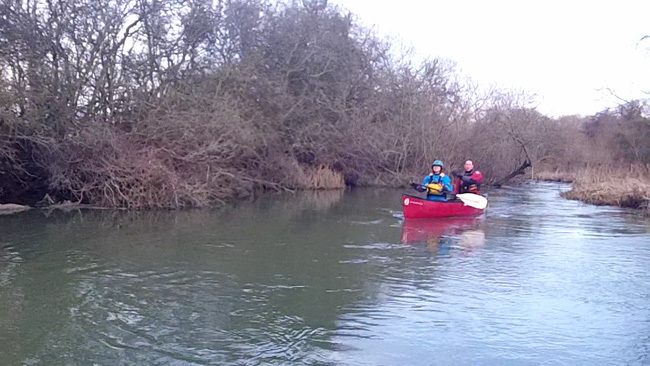 Peter Knowles excellent Pub Paddles – The Best Short Canoe Trips in the South of England gives a much more detailed description of the route and the local watering holes, just one of 27 trips included in the book. 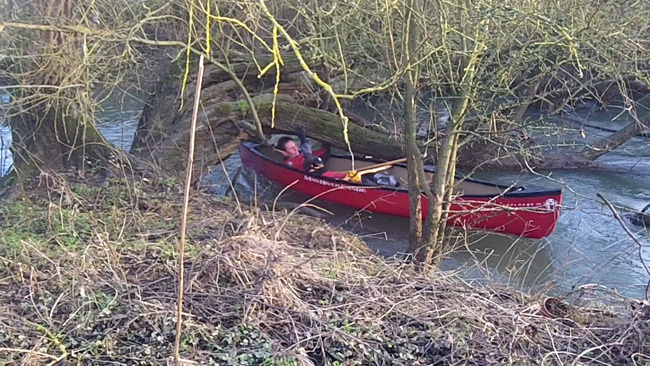 My thanks to Claire, Mark and Barbara for joining me on the Swift Ditch. Images courtesy of Claire Taylor.